Its that time of the year again! The most important festival for most Chinese, the Chinese New Year! A time where we can feast n snack till #fatdieme with no worries and restrictions or gamble "legally" at every house we visit. Looking at the hampers he received for the past decade, these small bundle of gifts really come through many changes. No longer are they stacked high up into pyramid style nor plastered with huge auspicious words such as 恭喜发财 or 财源廣进. Instead they are more stylish and modern looking, some are small and pretty enough to be displayed on the side table for all to admire. There are so many florist & gift companies in the market that we are really spoilt for choice! 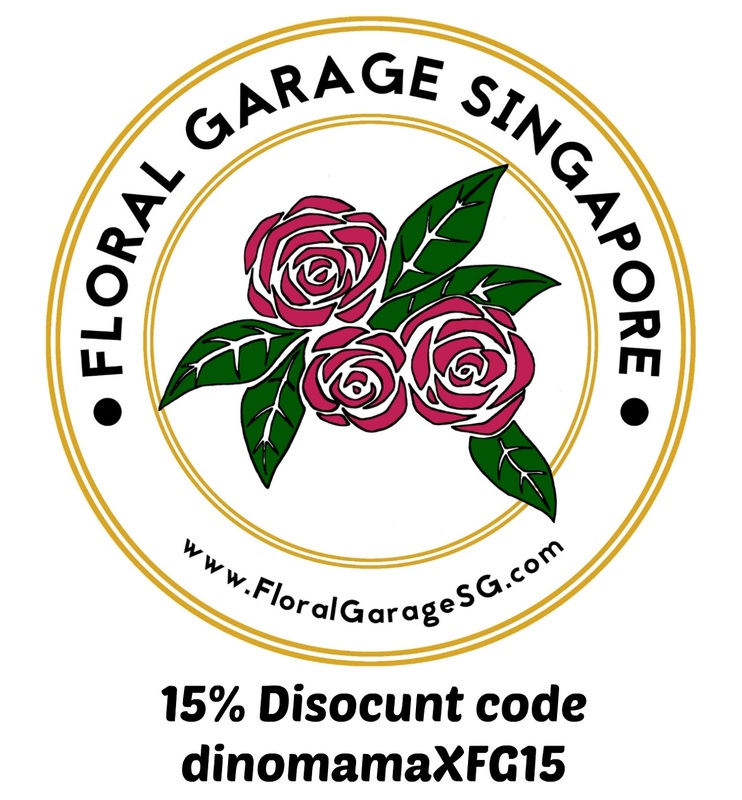 Today I am going to introduce one of the better company Floral Garage Singapore. I love how friends come together with a common interest, start a business and grow from there. Such is the case for Floral Garage Singapore, where Jonah and Justin joined forces in 2015 to form a team of avid floral hobbyists with ONE goal, that is to provide us with lovely bouquets made out of the best flowers, bundled with great gifts, prompt and excellent service. FGSG feels that no individual should be deprived of the chance to purchase a simple bouquet as a token of appreciation for someone special. Aww~~ that's so heartwarming to know that Floral Garage Singapore puts customers first before profits. 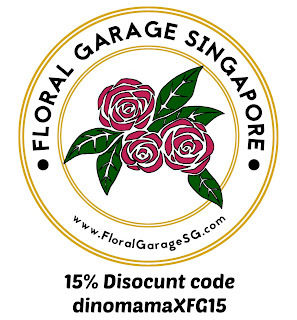 Floral Garage Singapore caters to both individual and corporate customers, with easy access and ordering from their online website, you can be sure that your orders will be accepted and processed on time. Since this is a post about Chinese New Year, let's look at their Chinese New Year Hamper. As you can see, their hampers are affordably priced and packed full of goodness too! Check out their Ultimate Fortune, their most expensive hamper no doubt but look at the things inside the hamper. It has Tiger King Abalone, Pomfret King Pacific Clams, Birds Nest, dried scallops, ginseng etc. I think this hamper is value for money and comparable with those from established gift companies. 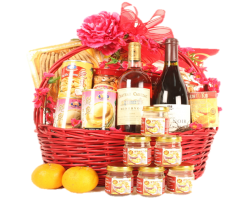 What I like about their hampers is they are red in color! Sure adds some excitement and vibes to the festive mood when you place them in the house. HUAT AH! Savings for You from Us! Of course! We don't keep good deals to ourselves, we like to share them with every one! 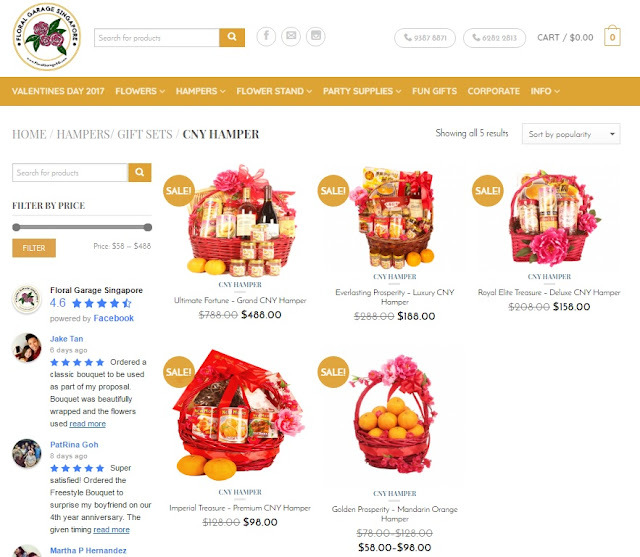 Remember to use our code when you purchase Floral Garage Singapore CNY hampers. More deals for you this Chinese New Year! 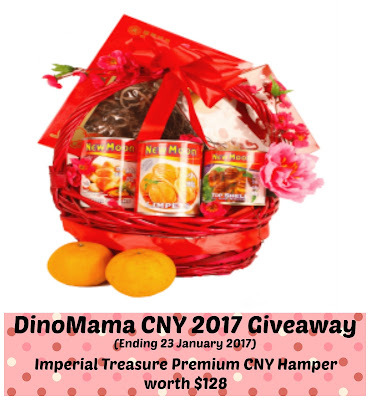 The good folks at Floral Garage Singapore is sponsoring one of they CNY Hamper for our giveaway~ Check out the details below. - Delivery date for the hamper will be decided by Floral Garage Singapore. Disclaimer : We receive a Golden Prosperity – Mandarin Orange Hamper from Floral Garage Singapore for the purpose of this post. No other compensation was received. 大吉大利! Wishing all a very happy and prosperous Chinese New Year! Hi Hui Ju, thank you for your support all these years =) Yes I agree that health is the most important wealth too! Wishing you and your family abundance of HEALTH in this new year! Wishing everyone 恭喜发财,身体健康! Thanks for the giveaway. Happy CNY to everyone! 恭喜发财! Happy CNY to everyone!! 恭喜发财! Wishing you a prosperity Chinese New Year filled with happiness, laughter and joy! The year of the Rooster is the time to overhaul our lives. And replace it with good ones. Cement our lives with love and laughter. Finally, build good memories with our loved ones. May the Year of the Golden Rooster show lots of gold on everyone! Huat ah! My favourite Chinese well wishes are 恭喜发财 , 财源广进 , 大吉大利, 岁岁平安 very one Huat huat with Good Health . My favourite CNY greeting is [ 心想事成 ] ! To me , achieving my wish / dream makes me happy all day long ! Hope this gift for my mum, I never buy hamper for her before base on thw price. Wish this cny I can it for her.